NEW YORK (CNNMoney) -- Commercial websites that use Amazon's cloud of Web services are still struggling after last week's outage, though many of the affected sites are back online. "We are still recovering from the ongoing issues with Amazon AWS [Amazon Web Services] and some historical data might be missing," said Chartbeat, a company that monitors the online presence of websites, including CNNMoney. When Amazon's cloud services crashed last week, it took down more than 70 sites, including the New York Times, Foursquare, Propublica, Reddit, Quora and Hootsuite. These sites were all back online on Monday. 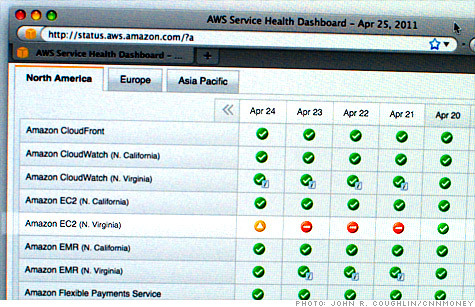 AWS' health dashboard reported Monday morning that service was finally fully repaired -- four days after a networking glitch kicked off a cascade of problems -- but that some customers' data storage had not yet been restored. Amazon said its technicians were reaching out individually to those customers. Amazon (AMZN, Fortune 500) wasn't immediately available for comment.